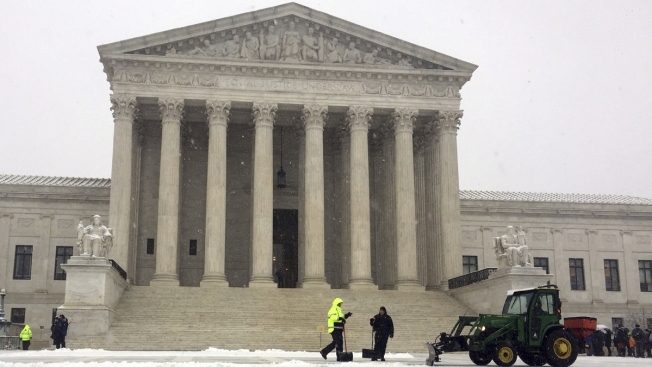 The high court said in an unsigned opinion that "federal judges are appointed for life, not for eternity"
Crews remove early morning snow during a winter storm at the Supreme Court, Wednesday, Feb. 20, 2019 in Washington. Federal judges can't rule from beyond the grave, the Supreme Court said Monday. The high court said in an unsigned opinion that a federal court can't count the vote of a judge who died in a decision issued after the judge's death. The justices said "federal judges are appointed for life, not for eternity." The case the court was ruling on involved Judge Stephen Reinhardt, a judge on the U.S. Court of Appeals for the Ninth Circuit. Reinhardt died on March 29, 2018 but was listed as the author of a decision issued 11 days after he died. A footnote on the decision said that Reinhardt, who was 87 when he died, "fully participated in this case" and that voting on it, his opinion and opinions written by other judges were completed and final before his death. But the Supreme Court said that it was "not aware of any rule or decision of the Ninth Circuit that renders judges' votes and opinions immutable at some point in time prior to their public release." The justices wrote that "it is generally understood that a judge may change his or her position up to the very moment when a decision is released." The court said that because Reinhardt was no longer a judge when the decision in the case was filed, "the Ninth Circuit erred in counting him as a member of the majority." "That practice effectively allowed a deceased judge to exercise the judicial power of the United States after his death," the justices wrote. The Supreme Court noted that without Reinhardt's vote, the majority opinion he authored was only approved by 5 of the 10 judges on the panel hearing the case "who were still living when the decision was filed." The Supreme Court sent the case back to the Ninth Circuit for reconsideration. The Supreme Court's decision aligns with its own practice — that when a justice has voted in a case but dies before a decision is issued their vote doesn't count. That happened most recently in the case of Justice Antonin Scalia who had voted in cases that were pending at the time of his death in 2016. The Reinhardt case had to do with the federal Equal Pay Act, which generally requires men and women to be paid equally for the same work. The question for the Ninth Circuit panel was whether, under the law, employers can use past salary to justify a disparity in pay. Reinhardt wrote that "Based on the text, history, and purpose of the Equal Pay Act, the answer is clear: No." Five judges agreed with his reasoning. Five other judges agreed with the outcome, but not with the opinion Reinhardt wrote. The case involved Fresno County public school math consultant Aileen Rizo, who sued after learning she made less than male colleagues. Rizo challenged the school system's policy that based all new employees' salaries on their prior salaries. The school system argued the policy didn't favor men or women. The policy has since changed.